I recently changed my domain name from a free hosting site to a paid domain. This was a good move for me because I was offered a commission to write some posts and they said I would get more offers with my own URL. Well, in changing my name I completely lost my goggle page rank. And in losing my ranking I haven't been able to get any offers. Go figure! People tell me it'll come back, but when?!? If you are feeling charitable, please visit my blog often and click on the title of the post you would like to read. This will signal a "direct hit" to my blog and help my ranking. Michael and I were excited about the paid posting bit because it meant more $$$ we could set aside for our adoption. We are hoping to finish that up this year! I had this idea to write one of these quick takes each day. I thought that would offer variety and the whole post wouldn't be so thrown together. But I guess that isn't my style because here I am throwing it together at the last minute. Again. We had our 12th night party (post to follow). I adore this celebration because it is just the seven of us and we are soaking up the time together. We crowned a new king and queen for the year. I was really excited about this year's winners because these two particular children seem to be the most emotional and get easily upset by small disturbances. They basically act exactly as I did as a child. The honor of being queen and king will allow them time and motivation to work through life without tears and meltdowns. We started schooling again this week. So far our revamped curriculum is working out well. Still looking into some alternatives for next year, but I have time. On a final note, I just wanted to stress to everyone that when you post something, whether on facebook, a blog, or in an email, it enters the world of cyberspace and is there forever. Even when it is no longer visible to you, or when you delete it, it is still there. So if you don't want the world knowing that you had toilet paper stuck to your shoe or that you hit a car in the Target parking lot and didn't leave a note... Don't Write About It On the Internet. Because it is still there. Forever. Like the photos in your high school yearbook. 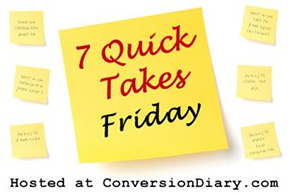 Check out even more Quick Takes over at Conversion Diary.